Starting today, the Seeds Of Deception updates will be featured exclusively in this thread! Continuing from here, here goes The Once and Future King! Edited by Cheetimus Primal, 02 March 2015 - 12:44 PM. Seeds Of Deception presents Differentiation (Act 1): Temptation. On the wake of Devastation, something is going to change in this universe. It's Megatron versus the Reapers (again). Also: Astrotrain makes a deal with a diminutive robotic devil! Transformers: Seeds Of Deception presents the G1 Style "Hun-Grrr versus Scattershot" cover for Special Story: Terrorcon Hunt. Linert by Joe Teanby. Colors by Chris Ludwig. Check out the stories so far to see what these not-yet-Decepticons are up to, read the notes to the cover for more details about the plot and, if you are an artist, join us to continue the saga! Transformers: Seeds Of Deception presents the SinnerTwin chapter for Special Story: Terrorcon Hunt. Lineart by Joe Teanby. Colors by Jason Nangle. 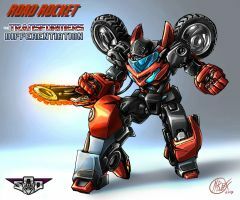 Transformers: Seeds Of Deception presents a new Earth mode for Road Rocket, who is now ready to enter the The Future Is -Ation saga! Road Rocket – a Generation 2 character, more or less – won’t be alone in the series…in more than one sense, if you get our drift! No pun intended. Transformers: Seeds Of Deception presents the Hun-Grrr chapter for Special Story: Terrorcon Hunt. 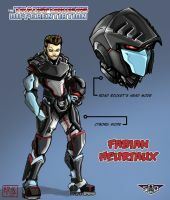 Transformers: Seeds Of Deception presents a partner for Road Rocket: it's Headmaster Fabian Heurtaux, a new human character for The Future Is -Ation saga! As a tribute to Simon Furman's and EJ Su's work, Fabian/Road Rocket will help us explore the relationship between a short-lived organic being and an alien robot whose lifespan extends to million of years. Lifestyles, values and psychologies will clash and merge as the duo joins Jimmy/Override, Hunter/Sunstreaker, Verity/????? and ?????/Hound. Seeds Of Deception is also on Facebook and Wordpress. The talent search begins again, as we look for color artist for Wrath Of The Ages #6, the final chapter of the miniseries. As a preview, the lineart of page 16, featuring the big guns. Can you name all of them? Also, a friend project makes its debut. It's Animated: The Menace Of the Car Electrician (act 1), featuring the usual big G1 tribute! 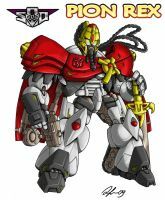 Transformers: Seeds Of Deception presents the War Within Protectobots model sheets. Based on their War Within: The Dark Ages apparition, as originally designed by Don Figueroa, these Protectobots model sheets were done in the same style of the art showcased in Transformers: The Ark - A Complete Compendium Of Transformers Animation Models Book. The notes to each character feature a link to the original file, which includes bonus such as front/rear view, weapons, updated references to the Protectobot G1 toys and detailed notes about the creation process. Edited by M3Gr1ml0ck, 11 February 2014 - 03:30 PM. Transformers: Seeds Of Deception presents pages 11-12 of Trannis. As Trannis' propaganda begins to spread throughout Cybertron, the most unthinkable Transformers characters are reached and affected by it. Whose lives will be forever changed? How will this fit with Trannis' plan and personality? And where will all this lead to? Each page features credits, behind-the-scenes notes and a link to the previous and following page! Check them out and find out that there's more than meets the eye to this project! Seeds Of Deception presents Combination (act 2): Dreams. What happened right after Maximum Dinobots, before the splitting of the timelines caused by the Magnificent Saga? In The Future is -Ation, just as Differentiation is about the fate of the Earth-bound Decepticons right after Devastation, Combination chronicles the deeds of the Earth-based Autobot right after the end of Maximum Dinobots! Check the Seeds Of Deception blog for more details, more comics, more fanprojects! Seeds Of Deception presents Cover B of the Trannis chapter: "Manifest Destiny". 14 of the Trannis chapter. Seeds Of Deception presents Ratbat: the full comic in PDF. With a new version of the cover, available on Deviant Art as well, the origins of the sinister character seen in War Within: The Dark Ages are now revealed! Once a greedy industry chieftain, Ratbat was more than met the eye (or the optic sensor), as his business attitude was just a screen to hide his savage, primitive self! When he realized that Sentinel Prime and the enlightened Cybertronian government could not be cheated or forced to let Ratbat recklessly exploit the natural resources of the planet, the wealthy mechanoid turned to the dark side of the society... the Underground Movement! Featuring Bomb-Burst, the Mayhem Attack Squad, the Battlechargers, the Triggercons, the Deluxe Insecticons, Starscream, Grimlock, Megatron, Springer and the Wreckers, this is a tale of fall and resurrection that spans from the Golden Age to the Civil War! Continuity notes, behind-the-scenes details and links to other comics are available on the Deviant Art version (each page features a Comment Section with credits and exhaustive commentary by the creators). Transformers: Seeds Of Deception presents the gathering chapter for Special Story: Terrorcon Hunt. They are finally gathered all together! Terrorcons: Hun-Grrr, RipperSnapper, CutThroat, SinnerTwin, Blot. Technobots: Scattershot, Lightspeed, Strafe, Afterburner, Nosecone. But the mystery of the Hunt is still unsolved: will the Techobots be able to merge their skills and knowledge to find an answer, even without merging into Computron? Transformers: Seeds Of Deception presents a tale from The Evil That Mechs Do. ...there was the Reign of Nova Prime. Supported by his twisted counsellor Jhiaxus and the nationalists Cyclonus and Grindcore, surrounded by enigmatic characters such as Galvatron, Nova Prime carried on an Expansion Campaign aimed at conquering and reformatting the whole galaxy. Chronicled here for the first time, the events of that era were hidden behind a carefully crafted propaganda of enlightened civilization purposes. A collection of lies, twisted facts and perverted truths, known as Transmissions. Seeds Of Deception presents cover A of Differentiation (Act 1): Temptation. It's Megatron versus the Reapers (again). Transformers: Seeds Of Deception presents the last 5 pages of Wrath Of The Ages #4. Blaster faces Megatron's full might, revealing his own ace up the sleeve: it's fancy Quintesson upgrades versus sheer military might. The identity of the brute that attacked Shockwave is revealed. And the Wreckers make their comeback! The notorious character who resurfaced in the last page of issue #4 is also featured in the cover of Wrath Of The ages #5. Art by Daniele "danbrenus" Spezzani, Hedge, Seb, Chris Ludwig. Edited by M3Gr1ml0ck, 14 July 2014 - 06:17 AM. Transformers: Seeds Of Deception presents the cover for Ebony Dawn. One of the first "spin off" projects for Seeds Of Deception, Ebony Dawn was based on the concept of the never-seen-around threat of the Ebony Knights, mentioned by Simon Furman in his G2: Alignment novel. The battle is referenced in page 13 of SoD: Sentinel Prime and in page 10 of SoD: Shockwave/Soundwave (where the attack of the Ebony Knight on Iacon is actually shown). Transformers: Seeds Of Deception presents act 1 of Wrath Of The Ages #5. It's the whys and wherefores of Grimlock's resurrection! Who wanted that, and why. But most of all--will the Decepticon army be able to withstand an overcharged and quite pissed-off Grimlock? Art by Daniele "danbrenus" Spezzani, Daria.